Mutual funds and ETFs are very different products but there are similarities with mutual funds. But lately, ETFs are grabbing attentions from mutual fund investors due to its many unique features like can be traded like a common stock, very low fees and other useful applications of the fund. We will discuss in details in this post about different features and factors of ETF and Mutual Funds. Mutual funds are the professionally managed fund which pools money from numerous small investors. The fund invests in stocks, bonds of publicly traded companies and government securities based on the objectives of the fund. There are various categories of mutual funds like equity fund, debt fund, balanced funds etc. 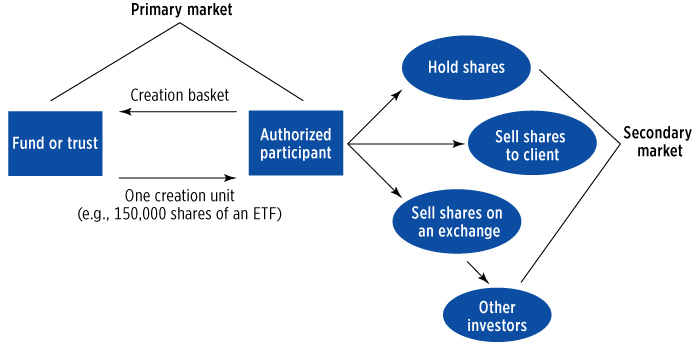 The creation of ETF units is more complex than creation of new mutual funds units. The process begins with the creation of ETF units. ETF shares are not directly sold to the public for cash. The sponsor of the Fund (Asset management company) takes shares of the companies comprising the index from different categories of investors like authorized participants, Large Institutional Investors. In return, it issues them a large block of ETF units called “creation units“. The dividend (cash component) which are given on the stocks is also taken from such investors in exchange of ETF unit. These ETF units are then listed and traded in an exchange. The outstanding ETF units are not limited. New units can be created by the same process and redeemed in exchange of ETF units to underline shares. In mutual funds, process is much simpler than ETF. When new investments are done on any fund, new units are created by purchasing the underline shares and new units are issued to the investors and during the liquidation of investment underline stocks are sold to pay the investor. ETFs are passively managed fund traded on an exchange as a common stock and price discovery is done in real time basis. Buying and selling of ETFs are carried throughout the trading session and fluctuations of price is affected by market conditions. As ETF’s are traded on an exchange, it can be traded for intraday positions and short positions can also be executed. There is no specific holding period for ETFs. One can trade in ETFs and invest for long term period also. Investing in ETF does not include any entry or exit load. The only brokerage charges are applied on the investment just like any common stocks. The expense ratio on ETF funds ranges from 0.1-0.5% which is adjusted to the price. For Mutual Funds Tax obligation on investment in equity funds (those fund with the equity portfolio of more than 65%) for the period of more than one year are Tax-free and for less than 1 year are taxed 15% short-term capital gains tax. For Debt fund, investment for a period of 1-3 years are considered short term and it is taxed @ 10% and for more than 3years, it is taxed 20% with the benefit of indexation. Minimum investment amount for ETF is Rs 10000. After the ETF is listed on an exchange, investors can buy or sell additional units only through the recognized stock exchange. Investment through Systematic Investment Plan (SIP) is not available for ETFs. Investment in mutual funds is more flexible. Investors can opt for a lump sum or Systematic investment plan (SIP). Minimum investment amount required is Rs 5000 for lump sum and Rs 500 if opted for SIP which can increase at multiple of Rs 500. ETFs can be used in trading strategies and for long term investment. Here are few advantages of ETFs for the different class of traders and investors. For Arbitrageurs, it provides them easy and low-cost option to carry out arbitrage between cash market and futures. Hello, Sasikala Kotak Nifty is a good ETF but you can easily beat it with a simple (large cap+Mid cap portfolio). Key being your time horizon should be more than 5 years. Feel free to write to me for any more help at sarab@bodhik.com. I am invested in Kotak Nifty ETF for past 5 years and the returns have been good. Can you suggest to move the corpus of around 4Lacs in the ETF to some good mutual fund at present ? What are the best ETFs to invest in India today ? How do you say mutual fund are better. ETF is best. I have many ETFs and they give good interest.